There's only one more chance left to catch the Houston Dynamo live at Robertson Stadium in 2008, and that is on Wednesday night, Thanksgiving Eve, as they host Firpo in their last match of the group stage of the CONCACAF Champions League. 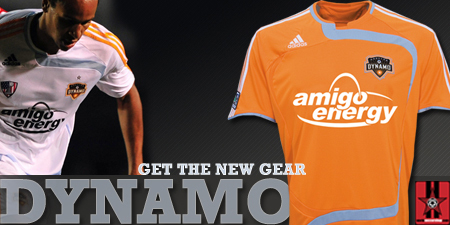 The Dynamo need a win to advance to the knock-out stage which takes place in February 2009. Tired of all your guests, bring them out to the game - special ticket package available, 10 tickets for $50.00. Speaking of 1560 A.M., today Dynamo CEO/President Oliver Luck was a guest on the Ken Hoffman Show, and he stated that he feels certain, more certain then ever, that the Dynamo will come to terms on a downtown stadium deal with the City of Houston and Harris County, and that the Dynamo will have their own home by 2011. Finally, before the Houston Dynamo suit up to face Firpo, the MLS's 2009 Expansion Draft for the Seattle Sounders FC will take place, here is a list of the Dynamo has protected defenders Bobby Boswell and Eddie Robinson; midfielders Brad Davis, Geoff Cameron, Ricardo Clark, Dwayne De Rosario, Stuart Holden and Brian Mullan; and forwards Brian Ching, Guy-Roland Kpene and Kei Kamara. It is anticipated that the Sounders will draft forward Nate Jaqua. In closing, Houston will host a round of matches in InterLiga 2009, and Houston will host the match up of Club America v. Chivas on January 5.